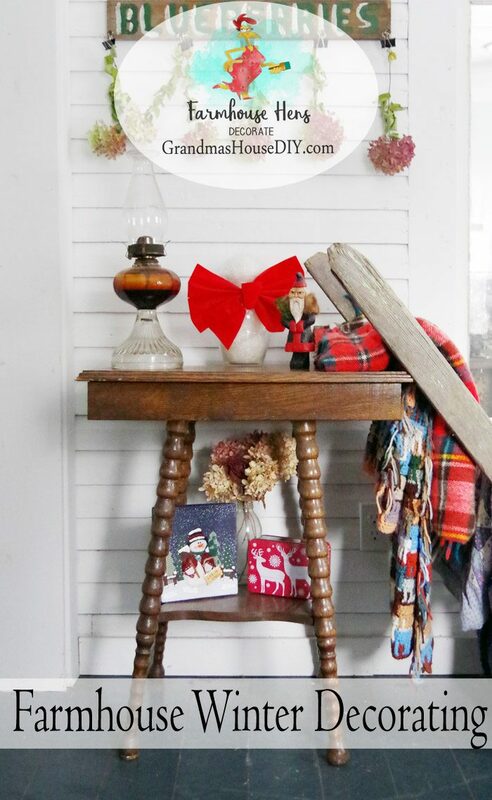 Farmhouse decorating - a winter vignette with inherited objects! 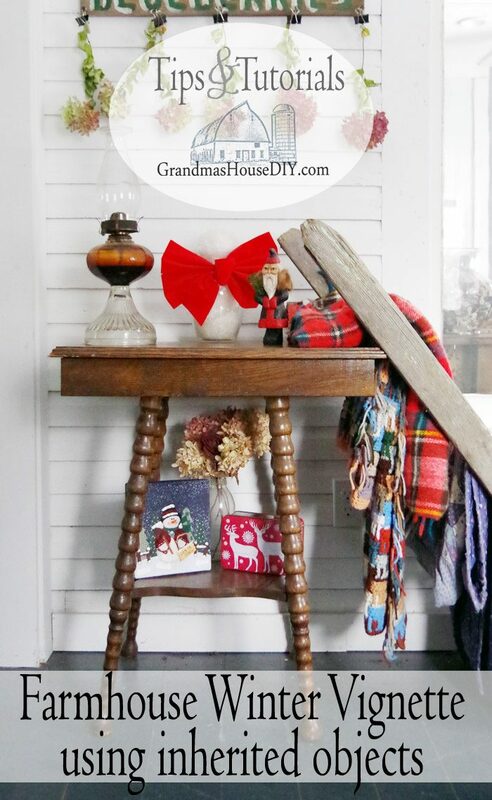 Farmhouse decorating – a winter vignette with inherited objects and keepsakes! 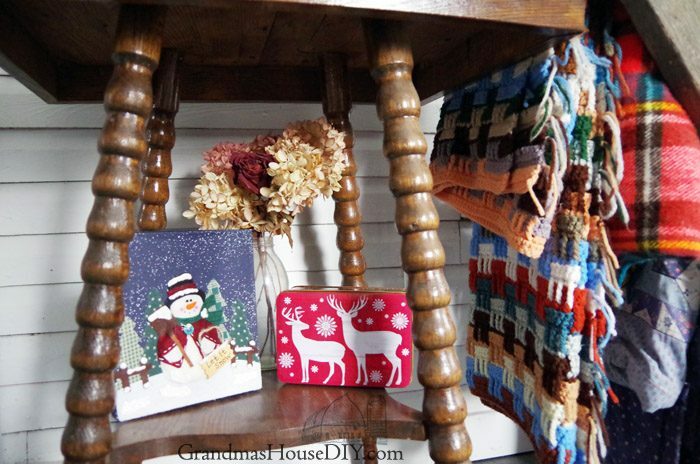 A winter vignette inspired by both of my grandma’s, farmhouse decorating using some of my very favorite keepsakes. 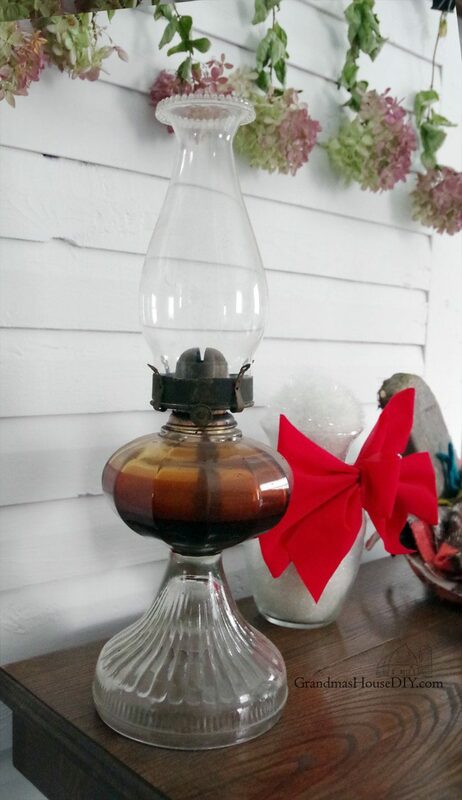 Every time I reach to decorate my home I want to include the old oil lamp I found in the basement. Cleaned up, I couldn’t believe how beautiful it was! 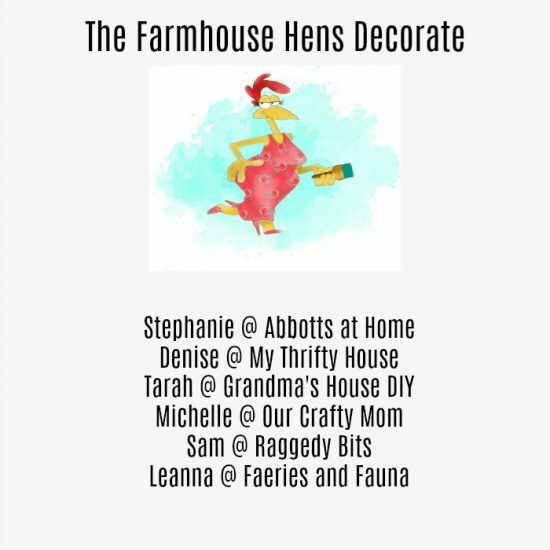 So, when it was time to put another vignette together with the Farmhouse Hens, I just had to include it like I did last time with my Fall Vignette! As many of you already know I just went through a divorce and have been keeping myself busy with different projects around my home. The current one I’m working on is converting my office into my guest bedroom and library! In said guest bedroom (where I decided to put up my little winter vignette) is the other half of my grandpa’s old ladder that I’m using in my closet as a shoe rack. It seemed only right to include it here as a blanket rack! All three of the blankets I inherited from my mom and each one of them holds a good memory for me. All of my decorating ends up focusing on objects that have meaning for me. I own very few things in my home that aren’t inherited or keepsakes and I think its important for the objects we keep to be more important to us then just things we need to dust. Seeing pictures of this little collection warms my heart and makes me smile! 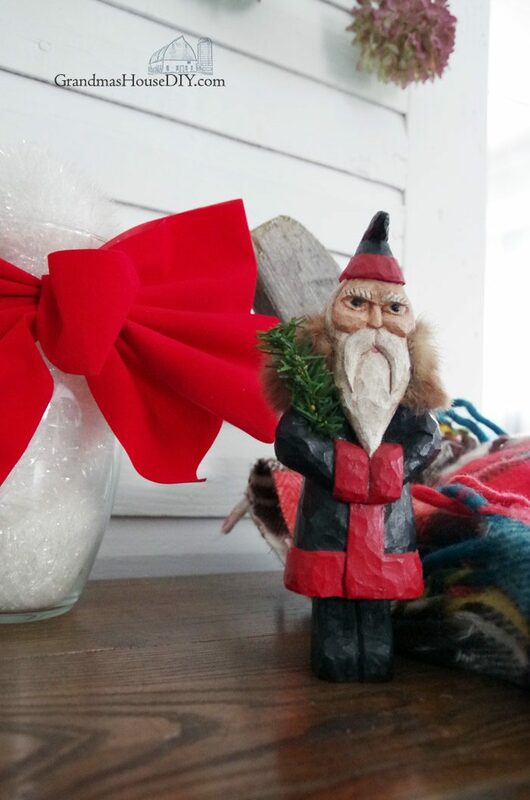 My grumpy little santa my aunt handed me the last time I had the opportunity to go and hang out with her and my uncle. She said my dad had purchased the little dude probably before I was born and it should be with me. The santa is an original from a well known local carver in my area and he will most likely be with me the rest of my life. His expression is very much so how I feel about winter! The other ladies joining me here have lots and lots more experience and talent with decorating then I do! Make sure and go and check out their projects below! The blankets are so gorgeous. I love all of them. Your guest bedroom is going to be fantastic I am sure. Dried hydrangeas always make me think of my grandmother. She always had them in vases around her house. I laughed when I saw the Grumpy Santa, but those blankets of course are my fav. Thank you so much Leanna! One of the blankets my Grandma made of course lol the other is a afghan my mom never finished that she started before I was born so I couldn’t ever part with it! The plaid one was just for color, an old blanket I’ve had forever. Thanks again! Such beautiful winter touches to your home! I love the blanket ladder and the sign with the dried hydrangeas! Happy New Year!! This is my favorite way to decorate!..using old inherited pieces. I have two oil lamps in the same style as yours. When I was a child my mother kept them high up on top of the china cabinet & none of us were allowed to touch them. She said she used them to do homework when she was a little girl during the depression (my mother was older when I was born & I’m reaching old!). So I use those lamps often. Though they are usually in a vignette on the same china cabinet that my mother used. I’m too nervous someone in my family will knock them over if I place them anywhere within reach. Hi Jenny, I do the exact same thing: normally that oil lamp is high up on top of a hutch too because I’m terrified I’m gonna break it lol but, every now and again in cases like this one, I very very carefully bring it down to share. It is one of my very favorite pieces left by my grandparents. Thanks so much for coming by and commenting! I am so sad to hear of your divorce. I can relate as my oldest daughter is going through the one from you know where and unfortunately two little people are involved. I love your blog posts and your farmhouse and all your ideas. Please keep them coming! Thank you Sue, I am relieved that it was just Joe and I, I can’t imagine going through this with little ones involved goodness knows that this is such a hard process anyway! Gorgeous vignette Taralynn! I love all of your special touches that you have added to make your vignette so cosy and perfect for winter. 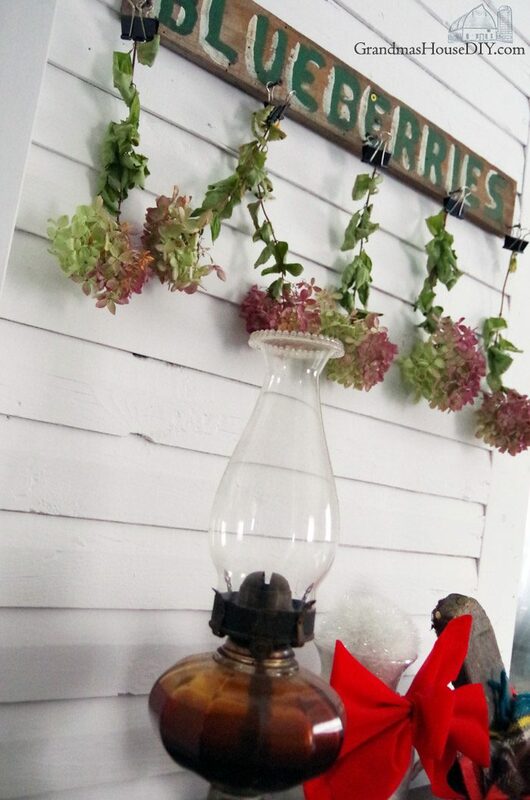 Tarah….I too love decorating with items that have a story or meaning. You’ve done a great job on your vignette. Love it all. Sorry to hear about the divorce. Glad you’re keeping yourself busy. And I love that you’re decorating with items that have meaning. That’s the best kind of decorating! Hi Tarah, it’s all looking so cosy and personal with your inherited keepsakes. A great way to keep busy. Thanks for sharing with us at the Blogger’s Pit Stop. Thank you so much Debbie! Hope you have a great weekend! I love farmhouse decor items, and the blankets look awesome! Stopping by from bloggers pit stop! Thank you so much Dara! Oh Thank you so much Jelica!! I hope you are doing okay after the divorce! The vignette is perfect! 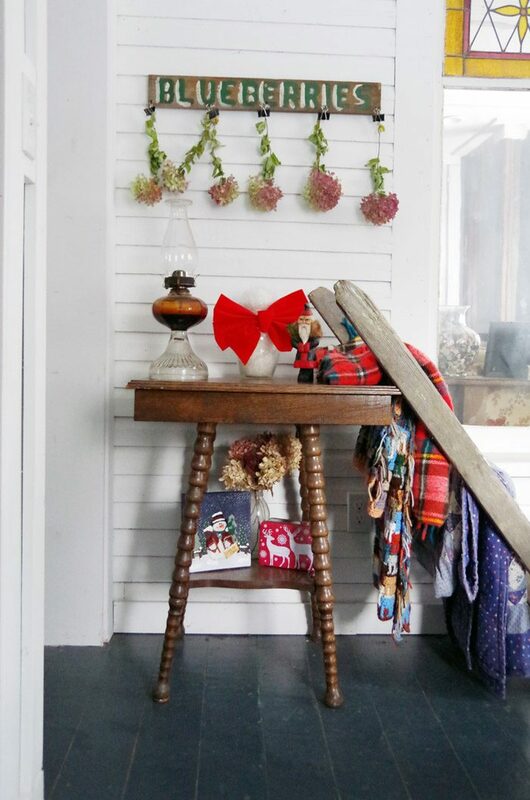 I love winter plaids and your hurricane lamp is wonderful! Thanks for sharing with SYC. Thank you so much Jann, I am finding my new footing again and keeping busy with projects lol, have a great week! Thanks for coming by Katelynn! This is so cute! I love the table and all the blankets! Tarah itis really special when you can create vignettes with your inherited treasures. Oh Karren thank you so much!!!! Have a great week! Lovely decor. I really love that angry little Santa! Thanks for sharing at Party in Your Pjs! Hi Tarah, just hopping by to let you know that you will be featured at SYC tomorrow. Oh thank you so much Jann!! WOW! What a great DIY idea. Thanks Tarah for sharing such wonderful ideas with us. I will try one like yours!! Thanks Rebekah for coming by!